Ground Floor One Bedroom. Walk right out from your lanai for a dip in the pool or a walk on the beach. Enjoy the ocean views from the lanai, kitchen and living room. Close to dining and shopping. 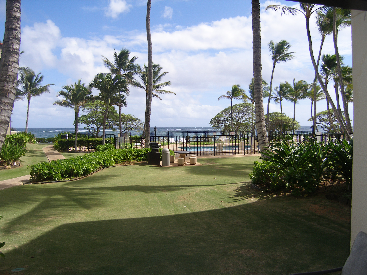 Kapaa Shores Oceanfront Resort offers an Oceanfront Swimming pool, Jacuzzi, Tennis Courts, Gas Grills and Shuffleboard. This could be a great vacation rental or your personal Paradise Getaway.